Learning the Xcode keyboard shortcuts is going to make you a more productive and faster iOS or Mac app developer. You can save time by practicing these 14 Xcode Keyboard Shortcuts in your daily code. If you teach online courses and want a camera with an incredible focus distance for detailed work, you need to get the c930 from Logitech. Focal distance is insane compared to my Canon 6D DSLR (30x the price!) with the c930. And it auto focuses super fast. It's a super wide angle lens and it gives you more creative freedom to get close to your work with a configurable mini-tripod mount from Joby. Logitech c930 super close auto focus and wide angle lens. Both cameras are 1080p and look stellar with auto focus and can focus within ~2 cm. Super FUN! And if you teach online, make sure you use Teachable.com to host all your videos + payment with Paypal + Credit Cards! It's so easy, so much better than Skillshare or Udemy! Make sure you don't miss any important emails from me by doing two things right now (this also works for any other email you don't want to miss!). In Gmail: Move messages from the sender (Paul@SuperEasyApps.com) from your Promotions Inbox Tab to your Primary Inbox Tab (left-click and drag). Add sender (Paul@SuperEasyApps.com) as a contact in your email client (i.e. : Gmail, Mail, etc.). Using both of these methods for any email will prevent you from "losing" emails, especially important ones. If you follow these steps, you will never miss an email from me. Gmail hides emails in your Promotions Inbox Tab, this is a short video demonstrating how you can make sure you don't miss an email. 1. Go to the Promotions tab to search for missing emails. 2. Left-click and drag from the email to your Primary Inbox Tab to move it. 3. Confirm that you want all future emails to move to your Primary Inbox tab from that sender. 2. Add the sender (i.e. : Paul@SuperEasyApps.com) to your contacts list in Gmail, Mail, etc. 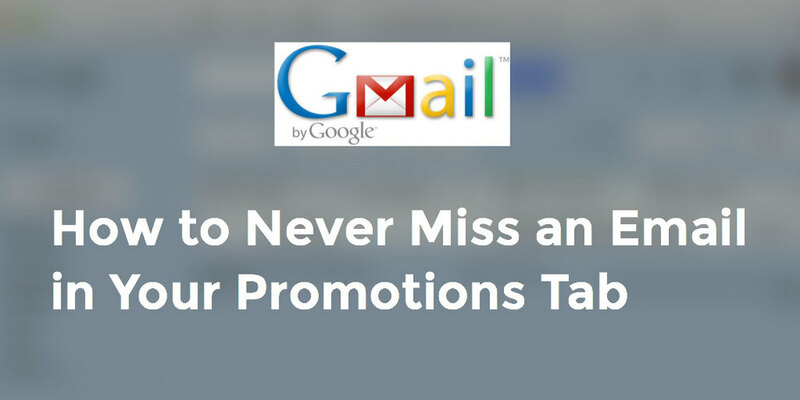 Watch the full tutorial on how to never miss an email using Gmail Inbox Tabs. In Gmail: Move messages from sender (Paul@SuperEasyApps.com) from your Promotions Inbox Tab to your Primary Inbox Tab (left-click and drag). Star any email from sender (Paul@SuperEasyApps.com) to tell Gmail that the email is important and you don't want it in your Promotions Tab. Read more about it on Google's support site. Did I help you find missing emails? Share this on Twitter by Tweeting this message.